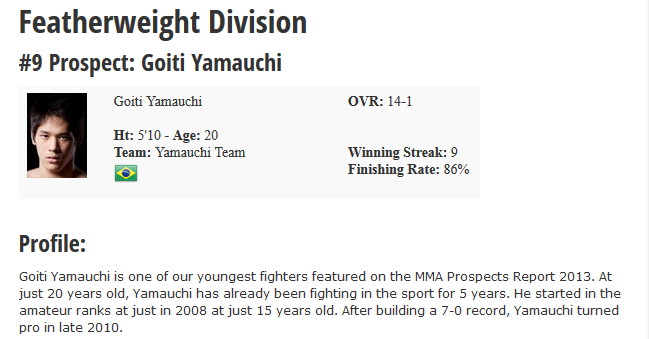 Goiti Yamauchi is one of our youngest fighters featured on the MMA Prospects Report 2013. At just 20 years old, Yamauchi has already been fighting in the sport for 5 years. He started in the amateur ranks in 2008 at just 15 years old. After building a 7-0 record, Yamauchi turned pro in late 2010. Yamauchi submitted his first 5 opponent before suffering his first and only career loss to fellow prospect Rodrigo Cavalheiro. Less than a month later, Yamauchi was back in the cage, and seemed to be more dangerous than ever, submitting his next 5 opponents in the 1st round. Yamauchi stepped up his competition level as he faced off against journeymen Jose Ivanildo and Jurandir Sardinha. Yamauchi would win both fights via decision before moving on to compete in Smash Fight’s 4-man, 1-night Grand Prix tournament. Yamauchi needed only 6 minutes and 32 seconds, to submit his way to victory, impressively defeating prospects Diego Marlon and Sergio Silva. Yamauchi was rumored to have been signed by Bellator shortly after his last fight, but he has yet to show up on their official roster page, nor has he been scheduled for a fight. Yamauchi’s camp leaves a lot to be desired at this point in time. Currently, he trains alongside his cousin under the tutelage of his uncle. His cousin fights at Flyweight and has a career record of just 4-5 overall. Though I have my doubts about the long-term viability of Yamauchi’s training environment, I try to remind myself that UFC star Lyoto Machida trained under very similar circumstances earlier in his career. Once Yamauchi begins to face stiffer competition, he will likely have to make some adjustments to his current training situation. He has likely never received the training necessary to combat an elite level wrestler. Yamauchi was born in Japan to Brazilian parents, who were of Japanese and German heritage. His family eventually returned back to Brazil, settling roots in Curitiba, Brazil. Goiti Yamauchi could be a future prodigy in the making. With a combined professional and amateur record of 21-1, all amassed before he turned 21 years of age is extremely impressive. His last 4 fights have been against fairly talented Brazilian competition, so his stock has definitely gone up considering his ability to face stiffer opposition. Yamauchi still has some very visible holes in his game. He routinely leaves his hands down while striking. Though he uses his jab and kicks to create distance, he has left himself wide open for a big puncher to take advantage. 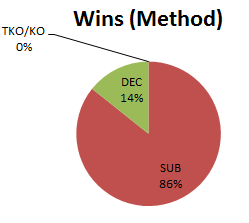 Yamauchi has avoided getting knocked out because he uses an extremely effective gameplan of pressuring his opponents and using his size to control the clinch wars. He uses trips and throws to get his opponents to the ground, and then it is usually game over. Yamauchi uses his long frame much like Shinya Aoki. His favorite submission looks to be the armbar, though most of his recent wins have come via rear-naked choke. Yamauchi’s size, age, and experience make him a very appealing prospect to watch. In one respect, should he sign with the UFC or Bellator, he may be thrown to the wolves too early and end up like Charles Oliveira, Nazareno Malegarie, or Fabricio Guerreiro. All 3 of those fighters came into the UFC or Bellator with a decent amount of hype and possessed slick ground games, but they have all came up short when facing top-level competition. At this point in time, Yamauchi’s lack of an elite training environment has him facing an uphill battle when eventually competing in a big promotion.